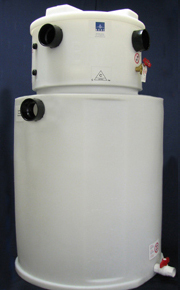 The RGW-350 is our second largest non-custom residential tank made by Brac Systems. This is the perfect solution for homes with up to nine people who want to save money on their water bill, while helping the environment. - Long-lasting HDPE molded shell. - 1 hp electronic control pressure boosting pump. - Electronic control water "make-up" system. - Programmable electronic chlorination system. - Greywater pipe marking tape included. Shipping prices vary depending on destination and quantities ordered: generally $450-$500. Estimated time upon order approximately four weeks. Our Brac Systems are guaranteed for 2 years world wide.